If I maintained a ‘Cool Wall’ for restaurants like they do for cars on Top Gear (yes, I’m presently partaking in my fav weekend activity of watching Top Gear reruns on Dave while food-blogging), the Riding House Cafe would go right up there in the top-right hand corner in the sub-zero section (with the likes of BobBobRicard). It was an extremely busy Friday dinner service the night we were there, so we had to wait about 10 minutes for our 9pm table to be turned over. Surprisingly though, I was completely un-annoyed at having to wait, happily people-watching away by the bar and absorbing the eclectic, uber-chic ambience of the place. The brainchild of the team behind Village East and The Garrison, the Riding House Cafe has only been open a few months, but it’s already cemented itself as a favourite in London’s NoHo district. And very much like the it’s 2 ultra-good-looking Bermondsey sister ventures, the deco here is a proper interior design lesson into how to make chic-eclectic work. 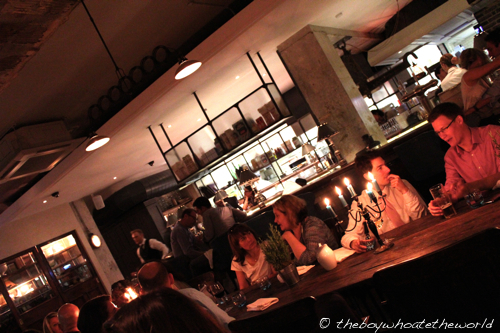 A rustic, long communal table dominates the space, running parallel to their buzzy, gleaming bar. There’s a phenomenal attention to detail in the pieces they’ve selected to make up the interior… everything from the lazy-lounge-style leather chairs towards the back of the restaurant to the ornate candle-stick holders and stuffed-squirrel-wall-lighting works wonders in creating that ‘feel’ of a place where you just know you’re gonna have a great time. Small, tapas-style plates seem to be the ‘in’ thing for new restaurants at the moment, and there are just under 20 to choose from here, with prices ranging from £3-£5 each. 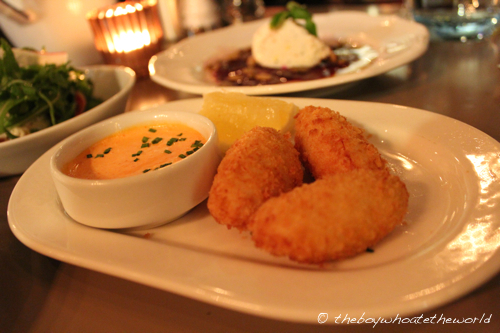 Salt cod croquetas were bombs of savoury flavour, deep-fried to a crunchy, crispy golden brown with a creamy romesco sauce that had just the right balance of sweetness and background heat. 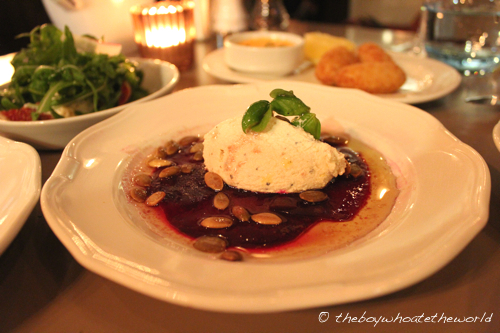 The Beetroot carpaccio was also particularly good… razor-thin layers of sweet beets were topped off with a silky-smooth, milky ricotta, a tangy vinaigrette and a sprinkle of crunchy pumpkin seeds to top off. There were a fair few ‘so-so’ dishes though. 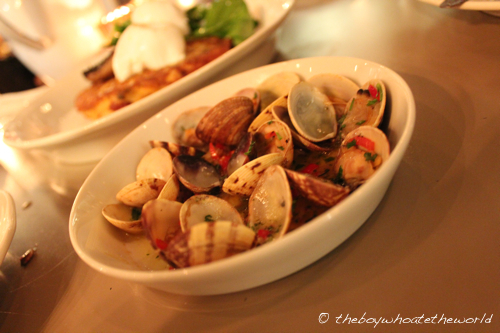 Their Vongole-style clams, although true their description could have shown a bit more love portion-wise. After taking off the shells (and there were merely a dozen), there wasn’t exactly very much left you could sink your teeth to. Underwhelming to say the least. 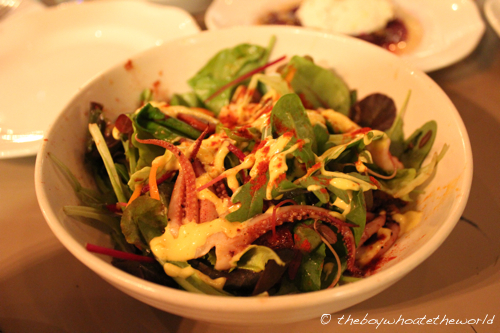 Grilled Squid and Chorizo Salad was nothing to shout about either… it had a lively, well-balanced vinaigrette but I would have liked to have seen far more Squid and Chorizo and little less leaves. Not wanting to go home hungry, we also ordered one of their larger main plates to share. Chorizo Hash, topped off with grilled portobello mushroom and two slightly over-poached eggs was much more brunchtime than dinnertime though…. I was left envious of neighbouring diners tucking happily into their Titchfield Burgers which were packed with foie gras and served with a mouth-watering pile of chips. On the whole, I can definitely see myself returning for another meal here in the coming months (maybe for brunch or the Titchfield Burger next time!). No complaints about the service – efficient, friendly and attentive… not much more you could ask for. Sure, the food wasn’t exactly mind-blowing, but the style and ambience here is quite simply off the charts. There are few better places in London at the moment where you will find more joy simply hanging out and passing the time if you ask me. Yeah, a weekend brunch here is def in order. Menu looks v appealing! 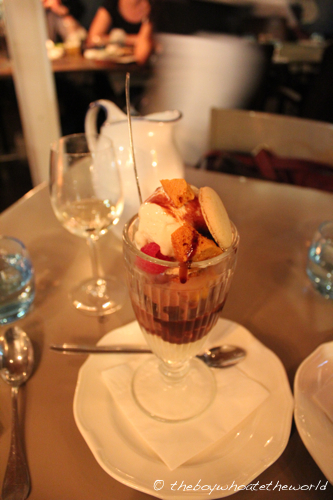 I wasnt too wowed by Village East although the food was good. Maybe I should try Riding House too. Kay: I really like the ambience of the place – lotsa interesting pieces of eclectic furniture. 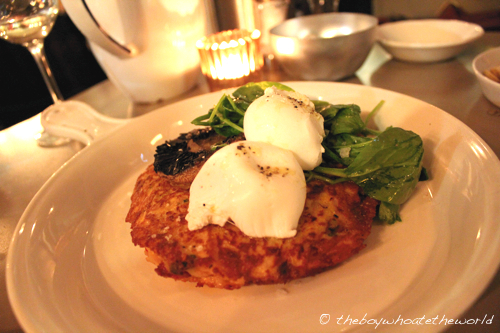 Planning on going back soon for a brunch as think it’ll be a great place to laze the weekend away!